Welcome to the MidHudson Mycological Association (MHMA) webpage. Feel free to brows our events where you will find most of our walk schedule as well as our monthly speakers and meetings. Most of our events are free and open to the public as our annual membership dues go toward providing the community with many mushroom gatherings. Want to become a MHMA member? Click on “join the MHMA” under the About Tab. When you are a member you will get email updates on events including invites to our members only mushroom walks and our delicious annual dinner. Soon you will be on your way to connecting with like-minded people and sharing knowledge about mushrooms. Where else are you going to find such FunGuys, FunGals, and FunPeople?! We are purely volunteer run so please be patient with updates and responses. If you would like to help out, please let us know. 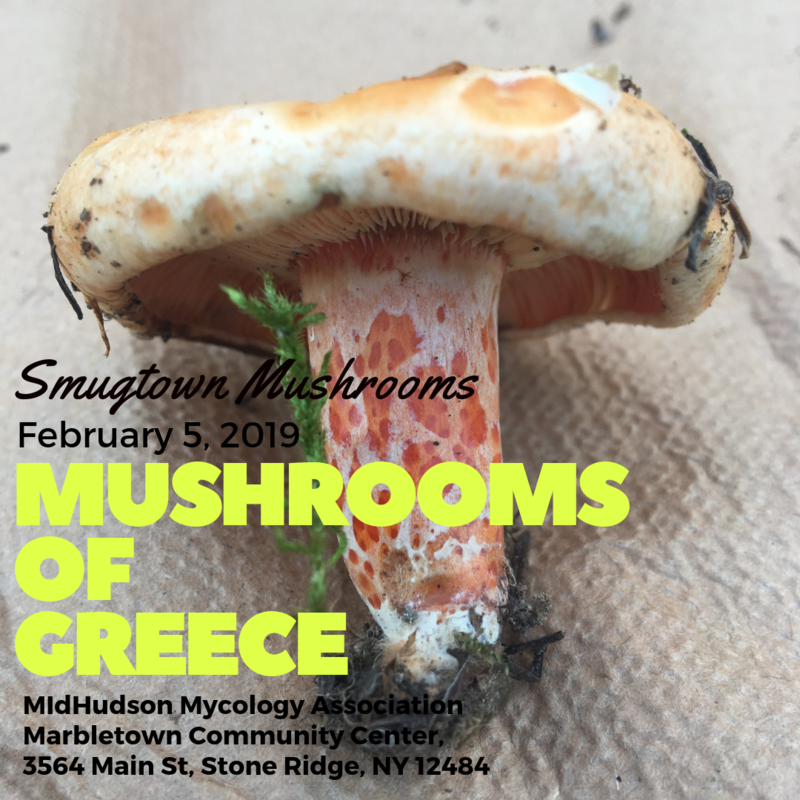 Every 1st Tuesday of the month we will meet at the Marbletown Community Center, 3564 Main St, Stone Ridge, NY 12484 at 6:45pm to hear from a different presenter on their expertise in Mycology at 7pm. Remember, these events are sponsored by the MHMA and are Free and Open to the Public so bring a friend or 4. We will have more presenters as the months progress. what connect us all, to each other and to the Earth. And so begins Bone’s quest to discover the hidden world of microbes in her illuminating and entertaining memoir, MICROBIA: A Journey into the Unseen World Around You. Eugenia Bone is a critically acclaimed journalist, with an emphasis on nature and food, and former president of the New York Mycological Society. She is a member of the National Association of Science Writers. Her previous books include Mycophilia,The Kitchen Ecosystem, At Mesa’s Edge, Italian Family Dining, and Well Preserved. Her books have been nominated for a variety of awards, including a Colorado Book Award and James Beard Award, and her work has appeared in The New York Times, The Wall Street Journal, Saveur, Food & Wine, and Gourmet, among others. Join Olga Tzogas from Smugtown Mushrooms as she showcases the fantastic world of the mushrooms, fungi and flora of Greece. Over the past 5 years Olga has been returning to her ancestral homeland seasonally to explore not just the ancient ruins of Greece but also the ancient mycelial networks present there. The typical image of Greece is usually coastlines and sparkling beaches of clear Mediterranean Sea water. Of course those vistas are worth the rave, but Greece is more than the beach and islands, its the mountains, the water, the hot springs, the forests, the plants, its the slow paced villages & the busy late night streets of Thessaloniki. Not often is this diverse country noted for its wide ranging cuisine, ecosystems and its flora and fauna. Take a look into the relationships the locals have with certain species of mushrooms & plants, & the recipes for use. In our discussion we focus on the different bio-regions visited and the Fungi that typically grow during the fall months. Enjoy a visual journey through the mountains, coastlines and villages of Greece. Olga Tzogas created & operates Smugtown Mushrooms in Rochester NY. Her journey with Fungi and plants started over ten years ago. Working with these allies by foraging in both urban & more wild settings, and developing skills to identify for food and medicine. 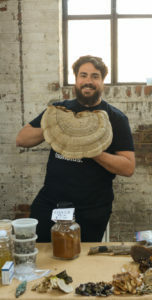 In 2011, Smugtown Mushrooms was established because there was a need for mushrooms & growing supplies, workshops, events & community based science in her area. While continuously learning more and embracing the never-ending, unlocked potential of mushrooms & fungi. Olga teaches workshops throughout the continent about wild mushroom identification, medicinal mushrooms, biology, and mushroom cultivation. 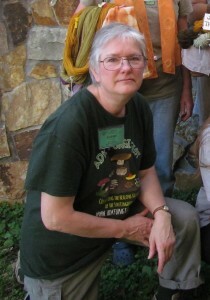 She was a core organizer for the 2016 Radical Mycology Convergence and the MycoSymbiotics Festival from 2015-17 and helped establish the first ever New Moon Mycology Summit in 2018. 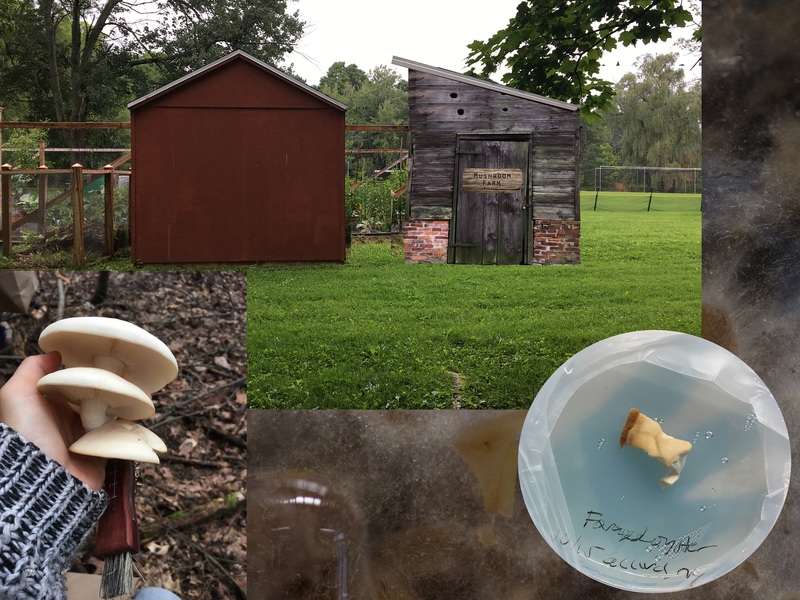 Mushroom Farm, is a collaborative community-based public art project in cooperation with The Reformed Church, Family of New Paltz, Village Grind Cafe, Bacchus Brewery, Mid Hudson Mycological Association and others. Mushroom Farm is a 10 year durational experiment that will be built adjacent to the free community garden on Huguenot Street in Spring 2019. The farm’s structure will take inspiration from a community smokehouse currently situated on Huguenot Street built in the 1800’s that was once a shared space for community to smoke their meats. Mushroom Farm is a collaborative space for education, research, community events, and a recycling system to produce food for the community. We will be discussing ways that people can get involved with the project as part of the presentation! Amanda Heidel is an artist currently pursuing her MFA in Sculpture at The State University of New York at New Paltz. Her educational and professional background includes communications, advertising, public relations, hospitality, and culinary arts. Her graduate thesis work, Mushroom Farm, is an interdisciplinary research project that studies biological materials, recycling processes, life cycles, and collaborative structures in an effort to prepare for a future of uncertainty. Her fungal entangled preparations are to enable forms of cooperation with the mushroom to guide us in living this paradigm shift while attempting to find footing in the present. 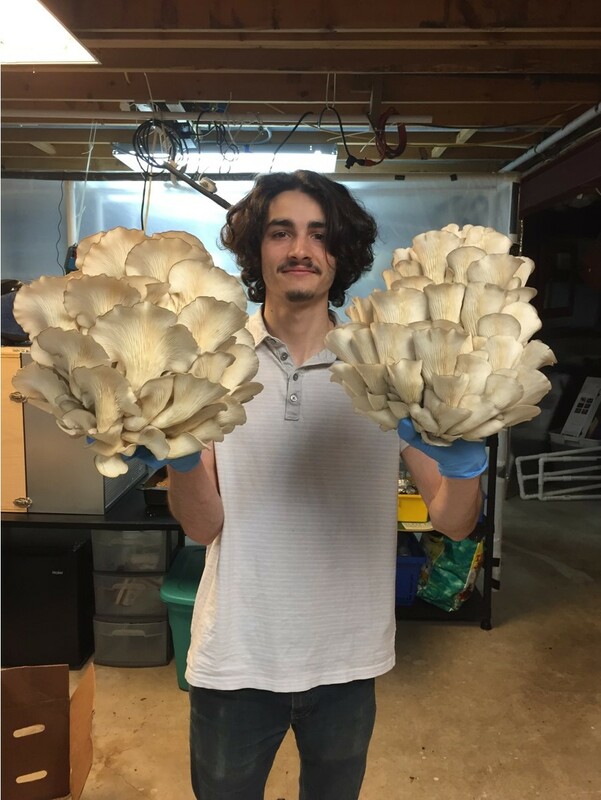 December 4th – Etienne Leblanc, a local mushroom grower, will be presenting Sterile transfer using a Glove Box & Flow Hood: mycelium culture, cloning of species, & grain. At this workshop we will perform Fungal DNA Barcoding, the process by which organisms are phylogenetically identified by comparing short sequences in their genome to similar specimens that have been previously sequenced in part or totality. When paired with morphological identification, phylogenetic ID offers an improved understanding of evolutionary lineage and the potential to discover novel organisms that have not been described before. Using fungal tissue samples from collected Mushrooms we will overview and perform DNA extraction, isolation, amplification, verification, and sequencing. fungi that you did not know existed. If you have a microscope, bring it. mycologist, so you can ask him just about anything, maybe he will know the answer. July 3rd & August 7th – 2 part microscopy workshop taught by Jeffrey Mann. After Jeffrey’s presentation this winter MHMA members enthusiastically requested a workshop on microscopy. Jeffrey has agreed to bring a few microscopes, members are encouraged to bring their own if they have them, as we will explore how to prepare slides and how to view microscopic features of fungi. This prsentation will be an introduction to various species of wild mushrooms that have been found to contain a rainbow of colors. Using a combination of dried mushrooms, handmade items, digital slides, and books, I will show the variety of color and share the excitement I have found in using mushrooms for color. Mushrooms as a source of color is not unknown over the last 400 years, but the recent interest and experimentation started in 1971 with the late Miriam Rice and her friend Dorothy Beebee in Mendocino CA. There is now an international group that holds a Fungi-Fibre Symposium every two years mostly in northern Europe. This is a chance to hunt and try new mushrooms for dyeing, to see the creative efforts after the dyeing, and to meet with those whose passion for mushrooms and fiber is contagious. Although mushroom identification is not a simple task, there are three major groups of wild mushrooms (plus several oddball varieties) that can be recognized for their use as natural dyers. Knowing where and when to look for the best mushrooms helps narrow the field for the beginner as well as the experienced hunter. I would like to demonstrate mushroom dyeing on a small scale. 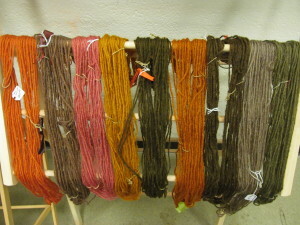 I will bring a precooked mushroom bath ready for a small skein of mordanted wool – and then start my talk by putting the wool in the bath and turning the heat on. 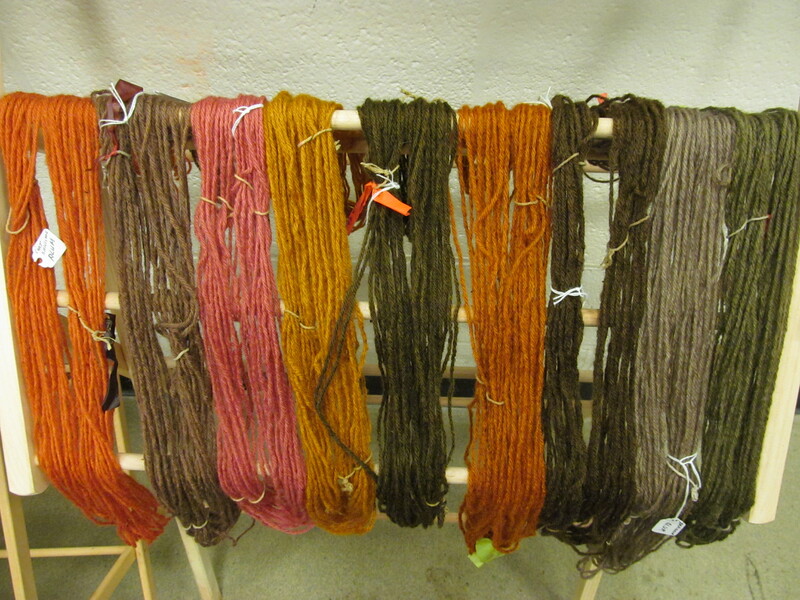 By the end of the talk the wool is dyed and ready for display. My Power Point talk will concentrate on the mushrooms used to obtain the best and most interesting colors. Susan learned to identify fungi as a member of the New Jersey Mycological Association for the last 37 years. She has attended most of the NEMFs and several NAMAs often helping with sorting and identification. After attending the 1993 International Fungi-Fibre Symposium in Scotland she became a “dyer”, learning the use of various fungi to dye wool. Even before becoming a “dyer” her main group of interest to study has been all of the tooth fungi particularly Hydnellum, Phellodon, Sarcodon. After retiring in 2009, Susan now lives in the Adirondack Mountains of NY learning the local fungi flora and continues to do many lectures, walks, and demonstrations on fungi and mushroom dyeing.